This is the last section of the tutorial where you’ll implement the finishing touches on your API. The goal is to allow clients to constrain the list of Link elements returned by the feed query by providing filtering and pagination parameters. Thanks to Prisma, you’ll be able to implement filtering capabilities to your API without major effort. Similar to the previous chapters, the heavy-lifting of query resolution will be performed by the powerful Prisma engine. All you need to do is forward incoming queries to it. The first step is to think about the filters you want to expose through your API. In your case, the feed query in your API will accept a filter string. The query then should only return the Link elements where the url or the description contain that filter string. Next, you need to update the implementation of the feed resolver to account for the new parameter clients can provide. If no filter string is provided, then the where object will be just an empty object and no filtering conditions will be applied by the Prisma engine when it returns the response for the links query. In case there is a filter carried by the incoming args, you’re constructing a where object that expresses our two filter conditions from above. This where argument is used by Prisma to filter out those Link elements that don’t adhere to the specified conditions. Limit-Offset: Request a specific chunk of the list by providing the indices of the items to be retrieved (in fact, you’re mostly providing the start index (offset) as well as a count of items to be retrieved (limit)). Cursor-based: This pagination model is a bit more advanced. Every element in the list is associated with a unique ID (the cursor). Clients paginating through the list then provide the cursor of the starting element as well as a count of items to be retrieved. Prisma supports both pagination approaches (read more in the docs). In this tutorial, you’re going to implement limit-offset pagination. Note: You can read more about the ideas behind both pagination approaches here. The limit is called first, meaning you’re grabbing the first x elements after a provided start index. Note that you also have a last argument available which correspondingly returns the last x elements. The start index is called skip, since you’re skipping that many elements in the list before collecting the items to be returned. If skip is not provided, it’s 0 by default. The pagination then always starts from the beginning of the list (or the end in case you’re using last). So, go ahead and add the skip and first arguments to the feed query. Now, on to the resolver implementation. With Prisma, it is possible to return lists of elements that are sorted (ordered) according to specific criteria. For example, you can order the list of Links alphabetically by their url or description. 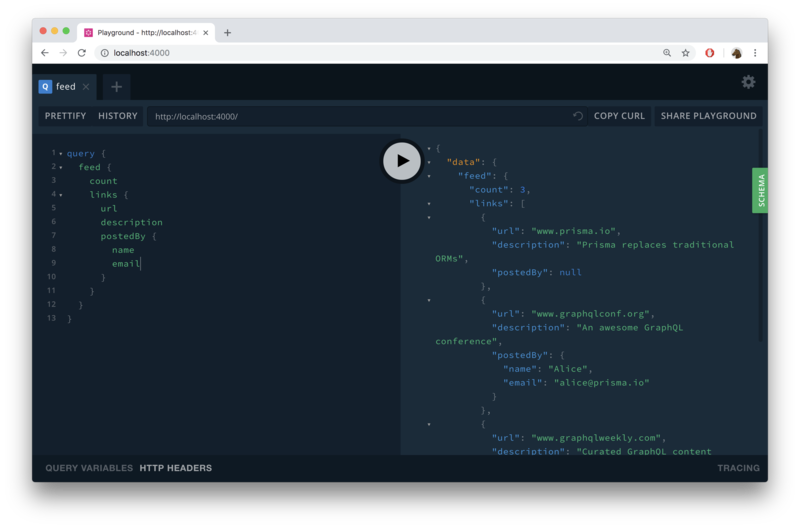 For the Hacker News API, you’ll leave it up to the client to decide how exactly it should be sorted and thus include all the ordering options from the Prisma API in the API of your GraphQL server. You can do so by creating an enum that represents the ordering options. It represents the various ways how the list of Link elements can be sorted. The implementation of the resolver is similar to what you just did with the pagination API. The last thing you’re going to implement for your Hacker News API is the information how many Link elements are currently stored in the database. To do so, you’re going to refactor the feed query a bit and create a new type to be returned by your API: Feed. You’re first using the provided filtering, ordering and pagination arguments to retrieve a number of Link elements. Next, you’re using the linksConnection query from the Prisma client API to retrieve the total number of Link elements currently stored in the database. The links and count are then wrapped in an object to adhere to the Feed type that you just added to the GraphQL schema. The last step is to include that new resolver when instantiating the GraphQLServer. Which arguments are typically used to paginate through a list in the Prisma API using limit-offset pagination?